Is America being "cleansed" of its Christianity? We asked this question on our television show Christ in Prophecy of Dr. Noah Hutchings, considered "The Dean" of American Bible prophecy experts. He is the director of a Bible prophecy ministry in Oklahoma City called Southwest Radio Ministries, the author of over 100 books, and at 90 years old continues to serve the Lord in his decades long call to proclaim the Gospel. Dr. Reagan: Noah, I understand you have written over 100 books, and are even now working on a new one? Dr. Hutchings: Yes, I am. I think it is one that needs to be written. It is titled, The Christian Cleansing of America. Dr. Reagan: What you mean by that really is how certain people are trying to cleanse America of Christianity? Dr. Hutchings: Yes, right out of society, out of the schools, and out of government. You can't post a Scripture up in schools anymore. To show how much things have changed, I remember when I was going to school back in 1927, and we started our day with prayer and Bible reading. Dr. Reagan: I was in school in the 40's and 50's, and when I graduated in 1956 from High School, we were praying at school every day. We were having devotionals every day. We were reading from the Bible every day. So, yes, a lot has changed, and it has changed very fast. Incidentally, I think you told me that you also wrote an article about the Christian cleansing of America, and that it had such an impact that one person called and ordered 30,000 copies of it, right? Dr. Hutchings: That is right. I wrote a newsletter on the subject and somebody from Los Angeles called and ordered 30,000. Dr. Reagan: Well then, I think you're going to have a good market for your book. Dr. Hutchings: I think it is one that needs to be written and disseminated, because Christians are not fully understanding what's going on in society around us. Dr. Reagan: I heard a speech by Jim Garlow, who is a Nazarene preacher in California, and he is a great church historian. He was talking about the history of the Church in the United States. He said we started out the first 230 years of this country, from the time of the Puritans, as the establishment of the United States. Christianity was the establishment. And then, over the years, we went from the establishment until he said in 2008 we became a persecuted minority. He says that's where true Bible believing Christians are today. We are a persecuted minority. Dr. Hutchings: I think Dr. Franklin Graham recently stated that Christians are in danger in the coming decade from more and more persecution all across the world. Dr. Reagan: All over the world indeed, and even in this country. The idea of wearing a cross around your neck, well you can't do that. You can't wear a cross on the job in many places here. You can't post the Ten Commandments in the classroom. What a Christian can't do just goes on and on and on. The limitations are becoming more and more severe as people are persecuted for their faith. Dr. Hutchings: It does seem like every week something new comes up that infringes on the freedoms of Christians to practice their faith. Dr. Reagan: I'm reminded of a court case that recently occurred in New Mexico. A lesbian couple went to a photographer and said that they wanted the photographer to photograph their wedding. The photographer replied that doing so would be opposed to their religious convictions. There were many other photographers they could have gone to, but they knew this photographer was going to refuse based on religious convictions, and because they wanted a court case. They did file a court case, and it went all the way up to the Supreme Court of New Mexico. The state's Supreme Court ruled that the photographer had violated the lesbian couple's constitutional rights. The photographer had to pay a large fine, even though it violated the photographer's religious beliefs. Dr. Hutchings: That's an absolutely true story. One of the chapters in my book will be on the judicial system, including the judges, the Supreme Court, and the Federal justice system. Decision after decision they rule is anti-Christian. 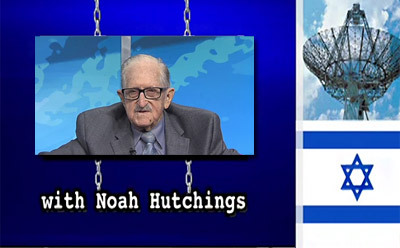 In the sixth part of this interview with Dr. Noah Hutchings on end time events, he'll talk about various signs that prove we are in the last days of this age. Christians have lived along side many types of people,religions and beliefs for centuries. But now they will not allow Christians to live along side them unless everything we hold dear is ground out. Christian values are what allowed the peace and freedoms that they now hold so dear. They must be very fearful of us or else we could live in peace with each other. It is so true and so sad what is happening but be glad because it just means the power of our Lord is terrifying to them and soon,very soon God's wrath will come.